Many of us know the pain of having allergies, and there’s a certain time of year when everything gets even sneezier and itchy; spring! That time of year when everything is flowering, the rain shifts all the dust and pollen in the air and you have that constantly stuffy nose, itchy, watery eyes, and non-stop sneezing attacks? Yeah, spring. If you are a fellow hay fever and allergy sufferer, fear not, there is a turf made just for you; Palmetto Buffalo. A lot of families opt for a low allergy lawn so that both themselves and their children can enjoy their time in the backyard without ramifications of allergies. This is especially true for children who are constantly playing and rolling around in the backyard, it would be a shame for them to miss out on such pleasures because of a sneeze attack! Research from the Department of Primary Industries (DPI) Queensland and HAL Richmond, NSW data have shown that Palmetto® Buffalo turf has 40% less seed than the average of other popular Buffalo types. Is it this seed, which is so common on cooler region turf types, which put large amounts of pollen in the air, especially when it comes to mowing and maintaining your yard. The benefit of Palmetto Buffalo is it’s softer edge when compared to other Buffalo types, which means less skin irritation for children and pets. While you might not notice the microscopic shape of these grass blades, they can made a huge difference to allergies and skin irritation. 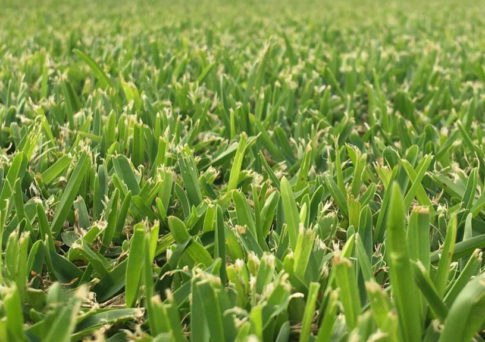 Check out the image below for an example of allergenic verse non-allergenic grass blades. Another benefit for not just the allergy-inclined, but for everyone, is that Palmetto Buffalo turf can be left a lot longer without mowing. So not only does that make it more suitable for those with allergies, but also those who are too busy to be consistently maintaining their lawns. What’s better than that? Want some advice on the best lawn for your yard and needs? Give the team at Go Turf a call. As the largest turf supplier on the Sunshine Coast, we understand your needs and offer a complete solution for transforming your yard. Call us today for a free quote on a wide variety of high-quality turf, cut daily on our farm. For more great turf, tips keep an eye on our website and all our social media channels.